"David’s fine, He’s one of our teammates. It could have been me that hit into a double play. It happens to everybody, man. He’s had 60 at-bats. A couple years ago I had 60 at-bats, I was hitting .170, everyone was ready to kill me too. What happened? Laser show. Relax." Relax, fingers crossed for that laser show. O.Ortiz has hit like 3 homers this season not enough for a guy who used to hit at least 30! 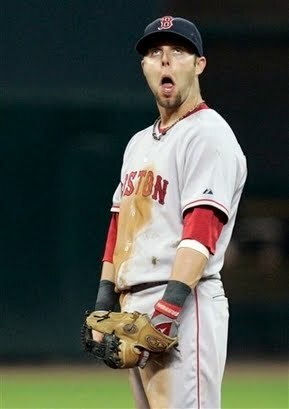 Gotta love Pedroia. Great locker room guy. That quote was hilarious. The way he said "laser show" was classic. Pedroia is a character. A great guy to have on your team! i laugh at this now. Homerun derby champ! "He used the "I can't see" and need an eye-exam excuse last year, and with steroids no longer an option people are really hating on the big guy. " Funny guy.And the funny picture. "everyone has slumps. let him play it off i say"What do you propose ? "David’s fine, He’s one of our teammates. It could have been me that hit into a double play. It happens to everybody, man. " I love this sharing. Everything might happen to everybody. Just to be ease.